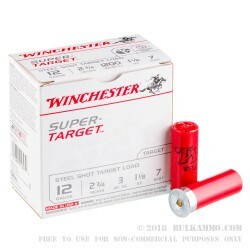 A steel target 12 gauge load suitable for those wishing to hunt small game with steel shot at short distances or for those looking for sporting purposes and wishing to remove lead from the equation or at least minimize lead exposure significantly. Steel is slightly lighter weight than lead so the larger #7 is equivalent in shot pattern density and travel distance to the smaller #8; 8.5 and #9 in lead shot. This means the #7 is going to behave similarly given all other conditions are the same and only the weight and density of the pattern packing is varying. 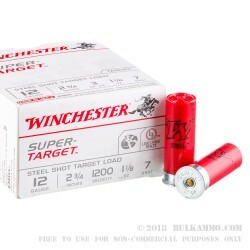 The Winchester Super-X loads tend to be incredibly consistent and thus, this shell can be expected to behave pretty similarly to lead loads of a smaller shot size. 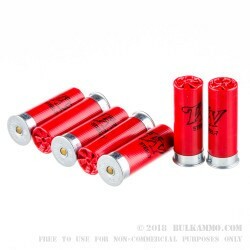 These are a low base shell suitable for reloading but in a price range that most shooters decide they don’t want to reload the rounds given the value pricing. Note: steel shot tends to be a bit more expensive than lead shot at this point still. 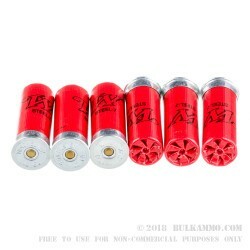 This is a 2 ¾” shell with a 1 1/8 ounce load moving at 1200 fps out of the muzzle and is suitable for use in all firearm types but will behave slightly differently in different choke configurations so some patterning may be necessary for precision shotgunning or longer range work. 1st steel I've ever used .... it works well!